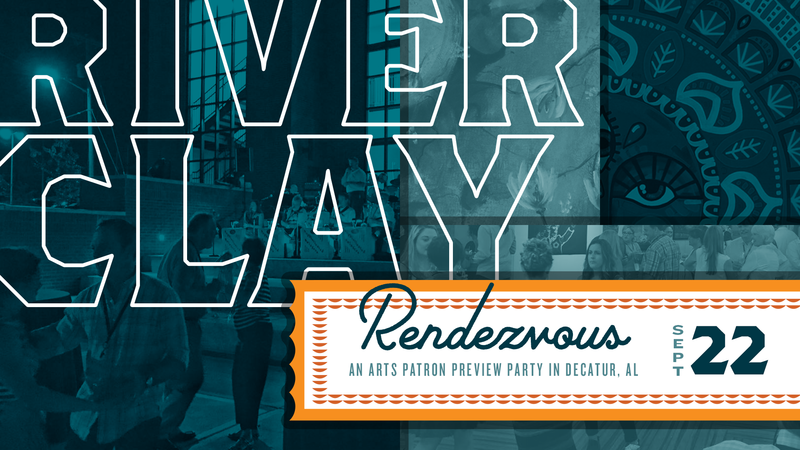 River Clay Fine Arts Festival kicks off on Friday, September 22, 2017 with River Clay Rendezvous – An Arts Patron Preview Party! River Clay Rendezvous is a casual event offering attendees the FIRST opportunity to browse the 2017 River Clay Artist Market… which means the first chance to purchase as well. In addition, attendees will enjoy music and great food provided by many local restaurants! Rendezvous opens at 5 pm at the Artist Market on the City Hall Campus festival site. At 7 pm, Rendezvous ticket holders are invited to join the artists at the Rendezvous Social at the Alabama Center for the Arts to enjoy more food and entertainment while viewing the “Inside Pike Road with Mose T: Sara Vessels Mills’ Private Collection” exhibit. Remember, to attend the Rendezvous Social, you must first attend River Clay Rendezvous! River Clay Rendezvous tickets are just $50 each! Reserve your spot today by contacting Jennifer Bunnell at 256.260.4299 or purchase tickets online. There are a limited number of tickets available so don’t wait… reserve now! Rendezvous tickets include weekend admission to festival. Fine art fairs and craft show event listings in the U.S.
Art fair opportunities for artists nationwide.